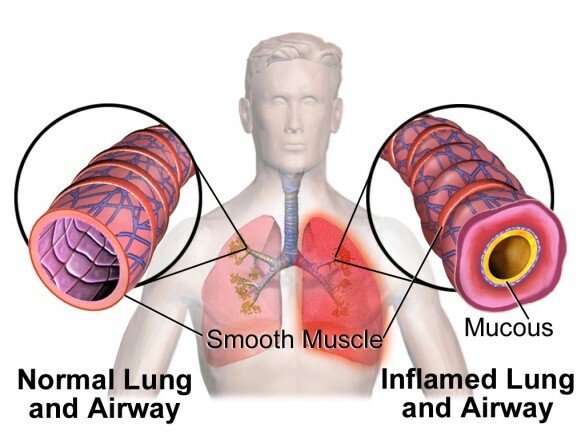 Bronchitis refers to the inflammation of the large and medium bronchi. Acute bronchitis is typically the result of an acute viral URI of the pharynx, throat, and bronchial tree, sometimes with secondary bacterial infection. Fever, lymphadenopathy, myalgia and other symptoms of a URI are typically present (see Colds, Flu and Fever). Viruses that cause acute bronchitis include adenovirus, coronavirus, influenza A and B viruses, parainfluenza virus, respiratory syncytial virus, coxsackievirus, rhinovirus, and the viruses that cause rubella and measles. Bacterial causes include Mycoplasma pneumoniae, Bordetella pertussis and Chlamydia pneumoniae. Acute bronchitis may also be caused by acute exposure to various dusts, fumes and smoke. Acute bronchitis is usually a self-limiting condition in most patients, with maximal symptoms occurring within three to five days after the onset of the condition, resolving over a two-week period. Complications usually only occur in patients with an underlying respiratory illness, including bronchiolitis and bronchopneumonia. Acute bronchitis is characterized by mucosal inflammation and the abundant production of sputum that is often mucopurulent. As the sputum accumulates in the bronchi, it initiates the cough reflex, which along with the ciliated epithelia, allows the sputum to be cleared from the air passages. In some cases dyspnea results from edema and spasm of the bronchial walls. Upon auscultation the breath sounds may exhibit occasional crackling, scattered ronchi, and wheezing after coughing. Along with emphysema and asthma, chronic bronchitis is a chronic pulmonary obstructive disorder (CPOD) that is defined as a chronic, productive cough experienced for more than a two-year period. The primary pathological features are characterized by an increase in goblet and mucus cells with a commensurate loss of serous glands and ciliated epithelium, resulting in a thick, viscous sputum that is difficult to expectorate. With repeated inflammation there is fibrosis and a thickening of the bronchial wall, which further impairs airflow. In progressed conditions hypertrophy of the right heart ventricle (cor pulmonae) can occur. In most cases the patient is a smoker, although environmental pollution is another important factor and is probably an increasing trend, especially in highly congested urban areas. Nutrient deficiencies such as vitamin A, vitamin D3, essential fatty acids and accessory nutrients may also facilitate the condition. In acute bronchitis bed rest and hydration are the usual therapies, along with antipyretics such as ASA and acetaminophen. Antitussives used to inhibit or suppress the cough reflex do so by depressing the medullary cough center, and include drugs such as chlophedianol, levopropoxyphene, dextromethorphan, and codeine. Expectorants are also used to help expel the congested sputurm from the respiratory tract by decreasing its viscosity, and include iodides (side-effects include acne, coryza, erythema of face and chest, painful swelling of the salivary glands, and hypothyroidism with long term use), syrup of ipecac (nausea and vomiting), guaifenesin (generally well-tolerated), ammonium chloride, terpin hydrate, and even creosote. Demulcents are often used as an adjunct to antitussive preparations including acacia, glycerin, honey, sugar syrup (a questionable antitussive) and sometimes an extract of Prunus virginiana bark. Antibiotics are the mainstay of treatment in purulent acute bronchitis, including tetracycline, erythromycin, amoxicillin or ampicillin: hopefully the choice is based on a cytological analysis of a sample of the sputum. The treatment of chronic bronchitis is directed towards the removal of the cause, which may include regular vaccination if chronic bronchitis is a common sequela to a URI, and smoking cessation. Patients may undergo allergy testing to determine the presence of potential allergens, and may be recommended desensitization therapy in weekly injections. Symptomatic therapy consists of bronchodilators such as β2-agonists (e.g. metaproterenol, albuterol, terbutaline, and pirbuterol) and anticholinergics (e.g. ipratropium). In come cases corticosteroids may be prescribed, either orally or topically, but there is little evidence of their benefit. Antibiotics are also sometimes used in acute exacerbations of chronic bronchitis, including increased cough, catarrh, dyspnea, and fever. In more severe forms of chronic bronchitis oxygen therapy may be administered. In Ayurvedic medicine kasa (cough) is caused by the inhalation of dust and noxious fumes, excessive exercise, foods that are dry, and the suppression of natural urges. There are five variants of kasa, including Vataja (dry cough), Pittaja (heat and inflammation), Kaphaja (swelling and mucus), Kshataja (caused by injury) and Kashaya (caused by asthenia and wasting, i.e. tuberculosis). In Chinese medicine bronchitis is differentiated based on the pathological factors, including the Retention of Phlegm with Extrinsic Cold (coryza with whitish sputum, floating pulse), Stagnation of Phlegm-Heat (thick yellow sputum, rapid pulse), and a Lung and Spleen Qi Deficiency (weak cough, SOB, thin and deep pulse). From a Western herbal perspective the causes of acute and chronic bronchitis are identical to that of modern medicine, although underlying factors are taken into consideration, include diet and nutrition, immune status and the efficiency of eliminative organs. 1. Isolate, limit and remove causes. assess patient for air-borne allergens, e.g. pollen, dander, dust, etc. 3. Treat infection and reestablish the body’s ecology. 5. Hydrate the nasal and sinus mucosa.